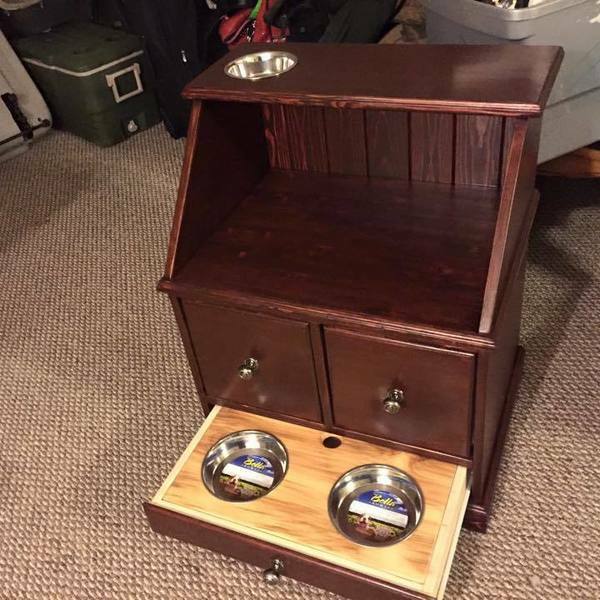 I built this station for a friend who needed a way to keep her dogs from eating the cats food and she wanted to be able to store the food near the bowls. I utilized mostly reclaimed pallet wood for this project. I planed and glued strips together to make the larger pieces required for the shelves and drawer fronts, I did use 3/8" plywood for the drawer bottoms. I stained with a Red Oak. I had seen a few projects on the internet but none of them incorporated everything i wanted so i combined a few of those ideas with my own to develop this concept. The Feeding station for the cat is located on the top shelf and the feeding station for the dogs are located in a drawer at the very bottom that can be closed when needed. There are two drawers above for cat food and dog food storage. The middle shelf will have a cushion added which will allow the Cat to have a place to lay.